| Another John Wayne masterpiece! 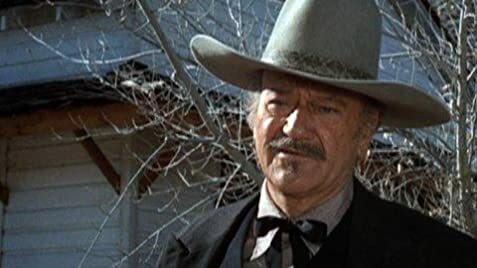 The legendary John Wayne gives a fantastic understated performance as J.B. Books an aging gunfighter suffering from stomach cancer and looking to live out the final days of his life in peace. Of course, the entire existence of the gunfighter is predicated on the inevitability that once you reach top there is always going to be someone looking to knock you off your pedestal. Here that means J.B.'s retirement won't be so peaceful. Besides this plot point, there is the mature twilight romance between J.B. and Bond (Lauren Bacall) and his mentor relationship with Gillom (Ron Howard). James Stewart (who co-starred with Wayne in The Man Who Shot Liberty Valance) puts in a cameo as J.B.'s physician. Recommended. John Wayne was suffering from heart problems during filming, the result of a severe bout of pneumonia in January 1974 that caused him to cough so violently that he damaged a heart valve. John Bernard Books: You told me I was strong as an ox! Dr. E.W. Hostetler: Well, even an ox dies. In the movie, a trolley car is seen (and used) several times. In each scene the street name of the car changes, yet the car number itself is always '16'.